That may seem like a silly question, right? Smoke detectors save lives, pretty simple. However, you might be surprised at how incredibly lackadaisical many folks are about these small, rarely noticed boxes of vigilance. I do it. You do it. We all do it. We pay attention to our smoke detectors pretty much only when they start chirping. And it always seems to happen right around 3 AM, on a night that you really, REALLY need that full night of sleep. And how many of you just get out of bed and unplug the detector and pull the battery out to go right back to sleep. DANGEROUS…. playing with fire, literally. Half of all home fire deaths occur between the hours of 11 pm and 7 am. Oh, sure, there are those unusual folks who religiously check their detectors and change their batteries twice a year. I am not one of them, and I know better. But give me credit, I'm writing this, and I will up my game, so to speak. Hopefully, you will too. With that said, all this goes for your carbon monoxide detectors too! Way back in the day, my family bought a brand-new home in a brand-new tract. We were very middling, as far as newbies. About half the houses in the tract had folks living in them, half were still vacant, but filling fast. There was a house about 300 feet from ours which had burnt down just before we moved into ours. My folks showed me the newspaper article, saying "Hey, look, this is where we are moving!" There was an image in the paper which showed part of a torso, covered in a T-shirt, the body surrounded by ashes. The picture did not show a face and wasn't a graphic image, but it was still shocking. I was under 5 years old and could not yet read the article. My dad, reading it, said "Well, it looks like the old boy fell asleep on the couch with a cigarette burning. Tragic, the whole family, wife, kids, they all died." I was horrified. "We're moving THERE!?!" I'm thinking THAT's the house we're moving to. "No, no, our house is across the way. We're not moving into that particular house" my mom and dad assured me. After they stopped laughing. I could never, ever, in all my years living in that neighborhood pass by this house without remembering the image I saw. Nor could I forget the smell of the house, the scorched walls, and roof. Of course, as a little kid, I ventured over there to gawk. I'd do the same now. It took years, or so it seemed to a 5-year-old, to rebuild that house. Something like that never leaves you. Back then, I won't say the year (pre-1975) because I'm not dating myself, there were no laws requiring smoke detectors in homes. As a matter of fact, mass production of affordable smoke detectors did not even begin until 1975. Sure, there were various types of fire detectors made from 1890 onward, (these measured heat), but these were expensive and used primarily in high dollar businesses. Had it been just a few years earlier, I might have never seen the image of the dead guy that was seared into my mind. Fast forward to today…there should be no loss of life when it comes to house fires. When smoke detectors hit the market, of course, my folks bought one. We called it "The Dinner Bell," because it sat in the hallway right outside the kitchen and went off about every third meal. Most people had at least one of these in their house, but almost never more than one. As laws changed, so did the placement and number of detectors in any given house. In the present smoke detectors are required to be 1 on each floor of any given house or domicile, and 1 must be in each bedroom. Additionally, carbon monoxide detectors should also be 1 to each floor. Loss of life due to a fire is easily preventable just by making sure you have working smoke detectors in your home. Here is a link to a couple of videos on the topic. Watch it in a new window, then come on back, and let's pick this up then. Infant Twins lose their lives in a home without smoke detectors. Don’t put yourself or your family at risk, make sure your home follows the current housing standards. 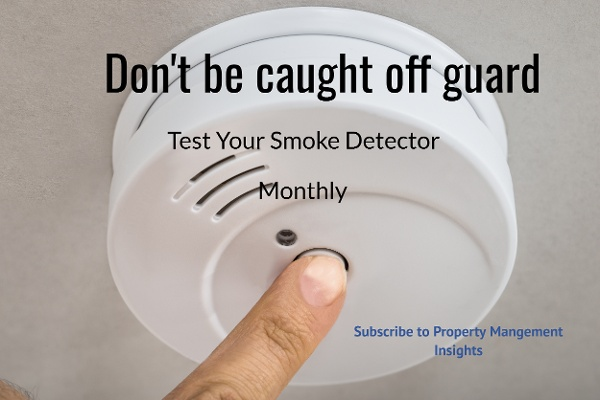 Some reports encourage you to test your detectors monthly to make sure they are working properly. Simply push the test button on the alarm and if it makes a beep you know it’s working. Change the batteries twice a year, a good rule of thumb…when the clocks change its time to change the batteries. When smoke alarms fail to operate, it is usually because batteries are missing, disconnected, or dead. Dead batteries caused one-quarter (24%) of the smoke alarm failures. Between 2011 and 2015, U.S. fire departments responded to a per year average of 170,200 home structure fires that involved cooking equipment. These fires caused a per year average of 510 civilian deaths, 5470 civilian injuries, and $1.2 billion in direct property damage. From 2011 to 2015, U.S. fire departments responded to an average of 466 home cooking fires per day. Cooking is tied for the second leading cause of home fire deaths. Ranges, or cooktops, accounted for the majority (62%) of home cooking fire incidents. Ovens accounted for 13%. Thanksgiving is the peak day for home cooking fires, followed by the day before Thanksgiving, Christmas Day, Easter, and Christmas. From 2009 to 2013, U.S. fire departments responded to 56,000 home structure fires that involved heating equipment. These fires caused 470 civilian fire deaths, 1,490 civilian injuries, and $1 billion in direct property damage. The leading factor contributing to home heating fires (30%) was a failure to clean. This usually involved creosote buildup- in chimneys. Most home-heating fire deaths (84%) involved stationary or portable space heaters. Nearly half (49%) of all home-heating fires occurred in December, January, and February. On average, 23 home candle fires are reported each day. The leading factor contributing to home heating fires (27%) was a failure to clean, principally from solid-fueled heating equipment, primarily chimneys. Nearly half (48%) of all home heating fires occurred in December, January, and February. Most deaths in home smoking-material fires were caused by fires that started in bedrooms (40%) or in living rooms, family rooms or dens (35%). As a property management company, we practice what we preach. During annual inspections, we test all detectors and carbon monoxide detectors. At move in, we provide instructions for residents to change their smoke detector and carbon monoxide detector batteries twice yearly should they have alkaline batteries. We regularly replace faulty smoke detectors with lithium-ion powered units, which remain powered for 10 years. How do we know when they are faulty? Smoke detectors are tested at the annual inspection. We use an aerosol smoke emitter on each unit. Smoke detectors that misbehave, at all, are replaced, period. We also instruct residents to replace their batteries if they cannot recall when they last changed them. Even at $4 each, that is an absolute bargain, if you consider it a $4 insurance policy which could save your family and thousands of dollars. I feel great when I leave a house and know that the people inside are safe from the threat of sleeping through a fire. I know I will not see their picture online, or in some newspaper photo. Additionally, I also check that all carbon monoxide detectors work. Carbon monoxide will kill you. It can't be seen, smelled, tasted, or sensed, and it is deadly. Picture this: You go to bed, and unbeknownst to you, a candle is burning in the other room. Someone innocently forgot the simple task of blowing it out. The day was long, and the night is cold. You're snuggled up under your warm blankets, and thinking about all you did today, and the items you want to do tomorrow, as you drift off to sleep. Your children, whose foreheads you kissed goodnight, their noggins filled with hopes for the future, and secure in the knowledge that you're there for them. Nothing bad happens when mom or dad are there, right? Only tomorrow never comes. Not for you. You forgot to change your smoke detector batteries, and an errant, freak ember just cleaved itself off the candle wick. I sincerely hope that scenario scares you to take action TODAY, not tomorrow.